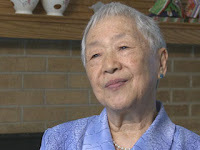 During World War II, Atsumi Ozawa, a Japanese Peruvian, was removed with her family from her hometown of Huancayo, Peru, and taken to the Crystal City internment camp, Texas. Her father had been arrested and taken beforehand, and in this clip, Atsumi describes a difficult train ride with her mother and sisters on their way to reunite with her father on the ship to the United States. Atsumi Ozawa's full interview is available in the Densho Digital Archive.